Packets of unsweetened Kool-Aid (or similar powdered beverage products) contain all the ingredients you need for an acid dye bath: citric acid crystals and food coloring. Slow cookers are perfect for simmering small batches of fiber. 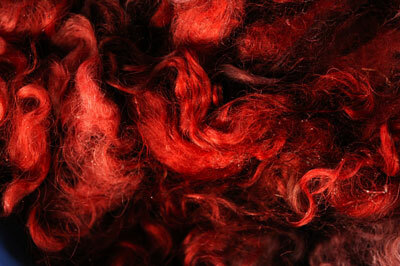 Because the fibers steep in a heated bath of color for a long time, the shades are deep and intense. Several colors added one at a time produce exciting results. The following demonstration uses washed mohair locks to produce a basket of rainbow-dyed fiber for spinning. 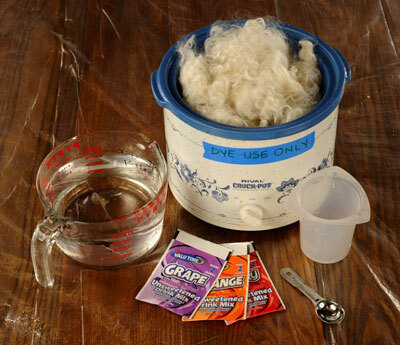 You can substitute similar amounts of wool locks, roving, or yarn for the same process. 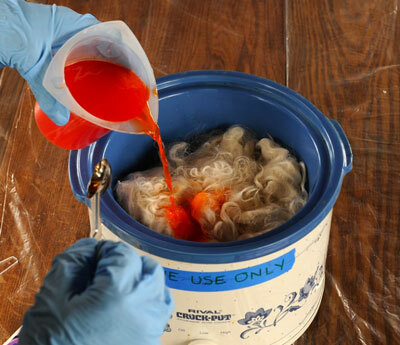 While Kool-Aid dyeing is very safe, you must still follow safety guidelines for acid dyes. 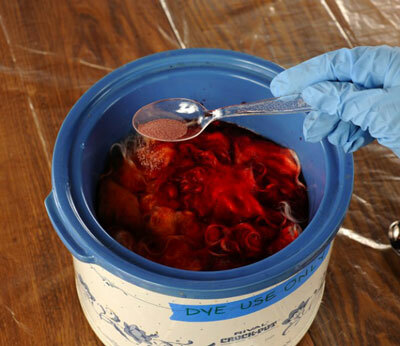 Once you use a slow cooker for dyeing fiber, dedicate it to that purpose. Add 1⁄2 cup (125ml) water to the slow cooker (or enough to cover the bottom of the pot with 1 inch of water). 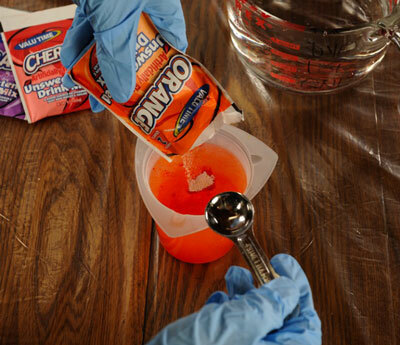 Mix 2 packages of orange Kool-Aid with 1 cup (250ml) room-temperature water. Mix 1 package of cherry Kool-Aid with 1 cup (250ml) water. Stack the damp mohair locks in the slow cooker. It’s okay to crowd the pot since you will not stir this dye bath. Plug in the pot and set the temperature to high. Start with the lightest color. Pour the orange dye slowly over one half of the fiber in the slow cooker. Place the lid on the pot. Wait about 20 minutes, giving the pot time to heat and the fiber a chance to absorb the orange. Then add the cherry dye to other side of the pot, pouring slowly and evenly. Wait 20 minutes more, then sprinkle 2 teaspoons of the cherry powder over the top of the pot using a plastic spoon. Replace the lid and let the fibers steep. Wait another 20 minutes and then sprinkle 2 teaspoons of the grape powder lightly across the top of the pot. Replace the lid and let the pot simmer for an hour or until all the dye has been absorbed. The water should be clear at the end of the process. Allow the pot to cool completely and then rinse the fiber.